The Government Technology Conference, held in Sacramento, is "the nation's largest and most respected technology conference for state and local government." The kinds of people who attend GTC include: Agency Executives, Chief Administrative Officers, Chief Information Officers, City Managers, Computer Operations Managers, Contracts Managers, County Administrators, Data Processing Managers, Department Directors, Deputy Directors, Elected Officials, Finance Officers, IT Directors, MIS Directors, Procurement Officials, Program Managers, Programmers, Project Managers, Senior Program Analysts, Telecommunications Managers, and Web Managers. LUGOD acquired booth space at the 2003 and 2004 GTC events, as well. Learn about our booth in 2004, and check out the photos from our 2003 exhibit. LUGOD is hoping to attend this year's event, GTC West 2007, which takes place the week of May 14th. If needed (see below), booth set-up would occur Tuesday. Break-down would take place immediately after the event, on Friday afternoon. This year, Bart Battaglia (Director of Technical Resources of Stanfield Systems Inc. in Folsom) is organizing a "Professional Organizations of Sacramento" presence at the event, which LUGOD has been invited to take part in. Once specifics are known, they will be posted to LUGOD's event coordination list, vox-outreach, and eventually updates will appear here. 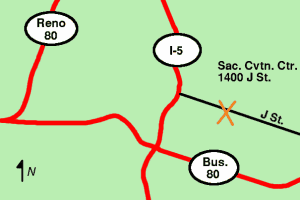 From Davis, and points west, take I-80 east towards Sacramento. Continue on Business-80 towards downtown. Then take I-5 north, and exit at J Street. The Convention Center is on the right, at 14th & J. A no-commitment, bootable 'Live CD' of Linux. Collections of popular Open Source software, but compiled for Windows. Provide a sixty (60) word profile for the Conference Guide (due to GTC by April 6th). Send to Barrt at Prof. Orgs. of Sac. by April 4th. Review GTC Exhibitor Instructions. Provide feedback to Bart by April 4th. Review GTC Product Locator. Provide feedback to Bart by April 6th. GTC Exhibitor Personnel Registration -- volunteers who wish to staff the booth must visit the following page to obtain a badge. Please review by April 4th. Professional Organization profile on standard template (logo, abstract, contact info) is due April 27th.